USB-C5-LC: one male USB Type A connector. USB-C5(-CE): one female USB Type B connector. SUN Blade?100, SUN Blade 1000, SUN Ray? SUN Fire?280R, and SUN Fire V20z. PCs with USB-enabled OS (Win 98/2000/ME/XP) and USB ports. MACs G4, G5, Xserve, and mini (using USB-C5-LC). USB-C5-LC: one female USB Type A connector. USB-C5(-CE): four female USB Type A connectors. Supports low-speed and full-speed USB devices. USB port supports up to 400mA current. Remote unit: 110 or 220 VAC at 60 or 50 Hz via AC adapter. USB-C5-LC: 1.2x1.9x0.7 (local and remote units). USB-C5: 5.2x4.3x1.6 (local and remote units). USB-C5-CE: 4.9x4.1x1.1 (local and remote units). The USB-C5(-CE) and USB-C5-LC are not designed to be connected to an Ethernet card, Ethernet router, hub or switch or other Ethernet RJ45 connector of an Ethernet device. 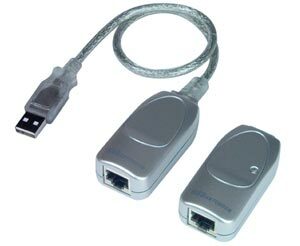 Damage to devices connected to the Ethernet may result. USB-C5(-CE) includes a one-meter male USB Type A to male USB Type B interface cable. Existing device cables with male Type A connector required. USB-C5-LC: extend CAT5/5e/6 up to 150 feet. USB-C5(-CE): extend CAT5/5e/6 up to 100 feet.